Dining out with food allergies can be a challenge, but it can be done safely. The best way to reduce risks is by being informed and openly communicating your needs. Dining out with food allergies can be challenging, but it can be done safely. 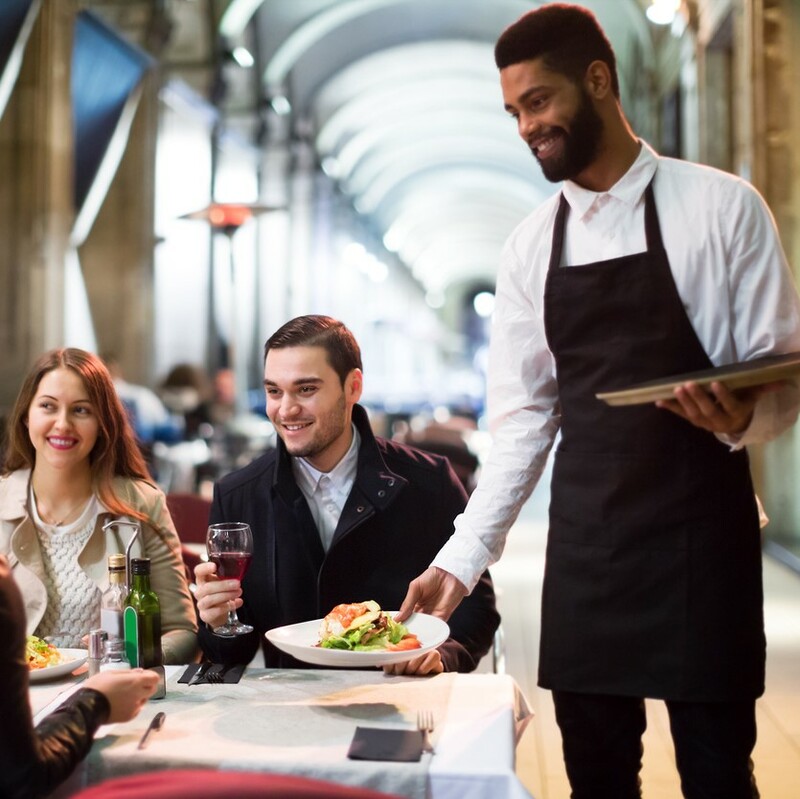 Learn how to eat out safely by following these tips. Visit the restaurant website and review the menu and allergy policies. If possible, phone ahead and talk to the restaurant manager or chef/kitchen manager. Try to phone at a quiet time for the restaurant so that staff can talk to you without distractions. If you will be eating with friends, tell them in advance about your food allergy and what to do in an emergency situation. Plan to eat out at “low-traffic” times (as opposed to the lunch rush or a busy brunch hour). That way, the kitchen staff will have more time to discuss your options with you and prepare your food. If you are invited to a party at a restaurant that could be risky for your allergies, eat beforehand so that you will not be tempted to eat something unsafe. Some restaurants will be willing to prepare something simple for a customer with food allergies even if it is not on the menu. Consider preparing a card that lists your specific allergies. This can be given to the chef after talking to restaurant staff about your allergy. Some restaurants provide ingredient and allergy information on their menus or online, however they are not required to do so. Its important to check with the manager/chef before placing your order to inquire about their allergy policies and procedures so you can make an informed decision on the menu options available. Asking questions about ingredients and food preparation will help you decide what option is best for you. Talk to the server and explain your or your child’s food allergy before you place your order. State what food(s) must be avoided, and make it clear that this is not a preference or being fussy. Ask how food is prepared. Cross-contamination can happen when the same equipment or utensils (e.g. spoons, knives) are used. Some examples: French fries may be made in the same fryer used to deep-fry battered shrimp and fish; a knife that has been used to slice pizza with anchovies (fish) may also be used to cut a cheese pizza; or burgers and buns may be flipped on the grill using the same spatula. If you feel like the server is not listening or doesn’t understand, speak to a manager or to the chef. Once your meal arrives, confirm it is the right one. If you are unsure about a meal, send it back. Let the restaurant know when they do a good job of providing an allergy-safe meal. They’ll appreciate the feedback! Always carry your epinephrine auto-injector (2 is recommended), just in case. Make it a rule that you or your child don’t eat without it. Go early, before the restaurant gets busy. Staff will have more time to answer your questions and help you choose your meal. Choose simple menu items (e.g. grilled steak with baked potato and steamed vegetable). Dishes with a lot of ingredients or those made in advance (e.g. stews and sauces) may have hidden allergens. Always ask before you order. Avoid salad bars and buffets. There is a high risk of cross-contamination. Spoons could be used for more than one dish, and food from one dish could be dropped into another. At some buffets, however, you can order directly off the menu instead. If there is any doubt that a safe meal can be made for you or your child, find a different restaurant. Unlike food manufacturers, restaurants are not required to list  priority food allergens  for menu items. It is up to you to ask about ingredients and the possibility of cross-contamination by reading the menu and talking with restaurant staff. Be sure that all tabletops (and under the rim of the table) are clear of food from the previous diners. This can help to avoid cross-contamination. Bring extra food and snacks for the child, in case you can’t order off the menu. Teach your child to always carry their epinephrine auto-injector and follow the rule: no epinephrine = no food.